We provide quality auto body repairs to your car without all the hassles commonly associated with the auto repair process. Check out our auto body repair shop photos and see some of the cars that we have repaired, designed and painted! 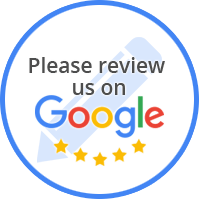 We pride ourselves in auto body repair, customer service & we work hard to ensure we provide the best customer experience. We understand that accidents happen & when they do we are here to help you put the pieces back together. Contact us today! Baker's Auto is a family owned and operated auto body repair facility specializing in both collision repair as well as complete auto refinishing. In business since 1991, Baker's Auto of Plymouth, MA is a one stop auto repair facility from the smallest scratch to major overhaul, we will provide quality repairs to your car without all the hassles commonly associated with the auto repair process. Located in Plymouth, MA, we are dependable and experienced auto body repair facility you can trust with your modern or classic car. Today, in our fourth generation of ownership, we are here to work for you. For more than 29 years, drivers like you here at Plymouth, MA have trusted our center with their vehicle repairs. That's because our current owner's grandfather, father, and son are committed to quality and value. We restore your vehicle to factory specifications using the very best equipment and paint. We conduct our business honestly with integrity. We take pride in what we do and stand behind all repairs. Don’t trust your automobile with anyone else. We are dedicated to offering complete, fast, and reliable Auto Body Repair for all makes and models in Plymouth, MA. Our trusted local technicians here at Plymouth, MA have years of experience on handling any auto body repair service to keep you running trouble free. 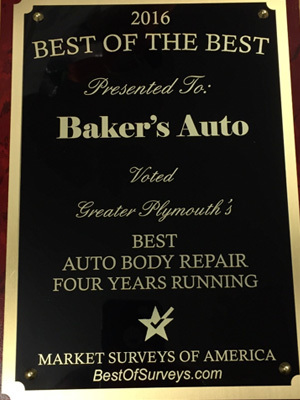 Here at Baker's Auto of Plymouth, MA, your car is in great hands with our professional team of technicians that will make sure your car running in excellent condition for the years to come. At Baker's Auto of Plymouth, MA, we are dedicated to offering complete, fast, and reliable Vehicle Scratch Repair for all makes and models in Plymouth, MA. Located in Plymouth, our state-of-the-art shop is ready to serve all your auto body repair needs. We provide quality repairs to your car without all the hassles commonly associated with the auto repair process. Your One-Stop Source For The Best Auto Body Repair Shop in Plymouth. Here at Baker's Auto we ensure that your repairs are done right the first time, so you can be back on the road quicker. We feature state of the art technology that will help restore your car to its pre-accident condition. We use a computerized system to straighten damaged frames and to mix and match paint. We understand that accidents happen, and when they do we are here to help you put the pieces back together. Every car that enters our paint booth leaves professionally finished and perfectly matched.